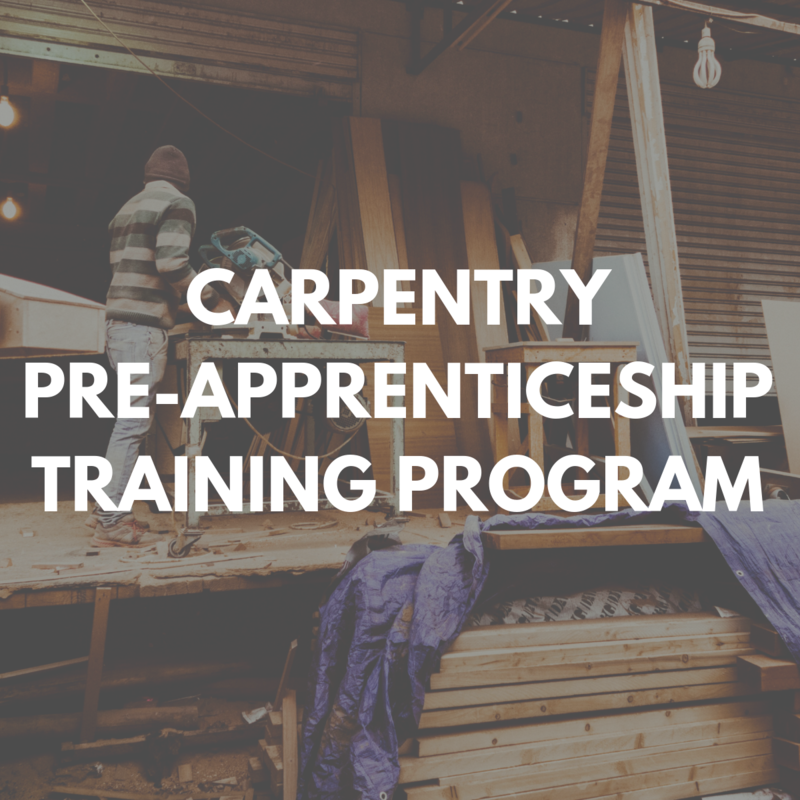 The Carpentry Pre-Apprenticeship training program will be starting in April 2019. Schedule a meeting with Vickie to learn more about the program and to apply. Contact Vickie Labranche at 416-591-0960. Our 27-week Carpentry Pre-Apprenticeship Training Program in partnership with George Brown College prepares Aboriginal people for long-term employment to address the shortage of highly skilled carpenters in the GTA. The program provides Aboriginal candidates with extensive carpentry training; both theoretical and practical experience will be gained throughout the program. Paid / Voluntary work placement (8weeks). During the first phase of the program, participants will be preparing for the rigours of the Academic Component for Level One Carpentry e.g. Mathematics which includes geometry, conversions (imperial to metric and vice versa), fractions and decimals, algebra, ratios and proportions, at a grade 12 level. In addition to this phase, participants will receive training to earn certifications that are relevant to our economies construction industry, such as First Aid/CPR Training. The second phase will be that of the participants George Brown College experience, which is where the participants will work towards achieving their Level One General Carpentry certificate. George Brown College our partner in terms of delivering level-one Carpentry training will provide a well-structured curriculum through instructors of Journey/person / CofQ (Certificate of Qualification) status. Lectures: health and safety, building code, tools and materials, rough carpentry, exterior/interior finish, and mathematical theory. Shop: projects that enhance skills, basics of measurements/implementations, foundations to meet industry standards and the opportunity to gain knowledge through an industry professional. Cultural teachings will be provided periodically throughout the program, this allows for a common balance amongst participants, engaging through teachings of storytelling, history and arts and crafts. The component brings the participants together, teaching them the importance of working well in a team and that effective communication through participation is necessary to develop oneself. The last phase of the program consists of a eight week work placement, where participants will be trained in everything from, framing, form-work, renovations, wood flooring installations, stair and handrail, depending on which direction the participant decides to build a career in e.g. renovations, framing and form-work, interior and exterior building, hardwood floor installation, cabinetry, etc. Miziwe Biik has continued to approach construction companies and associations in the GTA to develop relationships in the construction trade and to secure employer support. Outreach has included attending trade shows, industry council meetings, and ongoing direct web and phone-based efforts. We have been significantly more successful in securing commitments for work placements in this year over last. Furthermore, we have been very successful in securing paid work placements and this development has proved to be of mutual benefit to participant and employers. Employers are enjoying a more committed and dedicated effort in exchange for their support. Overall our Carpentry Pre-Apprenticeship Training Program is framing the way for Toronto’s urban Aboriginal people, through such programming, we meet the demand and need in today’s booming construction industry. Successful graduates will continue with their apprenticeship with aims of becoming fully certified to secure a rewarding career as a Carpenter. Our ongoing support and resources will be offered to ensure such goals are met and that our rapport with the Aboriginal community remains strong. For further information, call 416-591-0960. Frequently Asked Questions – Why Work in Construction and Trades? The following FAQs are courtesy of www.aboriginalconstructioncareers.ca. Please visit their website for additional information. Canada has been predicting a skilled labour shortage for several years. On the bright side, Ontario, more particularly, Toronto has a large and young Aboriginal population that can help in meeting this challenge. Overall, across Canada, in 2009, 36 percent of construction workers worked in Ontario, followed by Quebec (20 percent), Alberta (15 percent), and British Columbia (14 percent). There will be a demand for construction workers: From 2011-2019, the construction industry needs to attract close to 300,000 additional workers across Canada. Many of today’s construction workers will be retiring in the next few years. This means a lot of opportunities will exist for aboriginal workers who are eager to get into the industry. Hiring aboriginal workers is good business: Employers in the construction industry are becoming more aware of the benefits of hiring aboriginal workers in their company. Aboriginal workers can get training: Several programs exist that can provide funding or training to aboriginal people to improve their skills for construction trades. Visit Miziwe Biik Aboriginal Employment and Training and talk to one of our employment councilors – they may be able to refer you to a program that is right for you. Is construction work more than just manual labour? Yes. Construction needs highly-skilled and trained professionals. The high level of skills can be surprising. Did you know that a carpenter uses math on a daily basis, that a heavy equipment operator needs computer skills, or that a welder has to understand both chemistry and metallurgy? Construction uses high-tech equipment and needs adaptable people to work on a huge variety of projects. As a skilled construction worker you could be involved in building homes, schools, shopping centres or industrial plants. You could also work on civil engineering projects such as building highways, dams and bridges or installing water, sewer and communications systems. Do I have to travel to work in construction? No. You can choose a construction career that suits you. If you enjoy travel, being outdoors and working flexible hours, a career in industrial construction may be the answer. Heavy industrial construction projects are often located in remote areas where mines, pipelines or petroleum plants are being developed. Workers on these projects travel to and live in new parts of the country and are sometimes away from home for long periods of time. If you have a family or prefer to stay in one location, there are plenty of career choices that will let you do that. If you choose a career in home building and renovation or in commercial construction, you can find long-term employment with a large company. Will my skills be in demand if I enter the construction industry? Yes. The need for skilled construction workers has increased steadily for the last ten years, even when Canada’s economy hit a recession. The demand for skilled construction workers is strong and will increase. According to statistics, the average construction worker is in his early 40s. It is expected many workers will be reaching retirement age in the next decade and job opportunities for new construction workers will grow in every region of the country. How much can I earn as a construction worker? There are tens of trades in the construction industry and each has its own annual salary. Income depends on the sector worked in and the nature of your contract. In general, you can expect to earn as much as, or more than, someone with a university degree. It also costs less to learn construction skills than to earn a university degree and, if you enter an apprenticeship program, you can earn while you learn. Will I receive work-related benefits? Yes. Many construction workers receive statutory holiday and vacation pay. Depending on your contract, you may also receive benefits such as group insurance for health, dental and vision care, retirement packages and training benefits worth up to 30% of your annual salary. If you are self-employed, you may have to take care of your own benefits. Do I need to finish high school to enter the construction industry? No. If you start out working as a general labourer without a high school diploma, you may be able to learn on the job and advance to more senior positions through experience and additional training. If you enroll in a college or university program, you will need a high school diploma or equivalent. In general, apprenticeship programs require that you have a Grade 12 education or equivalent while other ones require at least a Grade 10 education, with a strong emphasis on mathematics and literacy. As a woman, will I fit into the construction industry? Yes. Most women in construction say it’s a rewarding career. You must also be prepared for a challenge: most workers are men. The number of women in construction is increasing and workplace environments are changing as a result. Women are also more prepared for construction careers than in the past thanks to organizations that provide appropriate training. An apprenticeship is a way to learn trade skills while you work and earn good wages. It combines hands-on training in a classroom/workshop setting with on-the-job experience that lets you earn while you learn. An apprenticeship program leads to professional certification as a journey/person. How much can I earn as an apprentice? In most apprenticeship programs you’ll earn a percentage of what a journey/person would earn and your earnings will increase each year until you’re certified. Wages, terms and conditions are usually determined by the province of Ontario regulations, labour organization agreements and/or a combination of both. How long do I have to apprentice before I can be certified as a journey/person? Generally, it can take from one to five years to complete your program and become a certified journey/person. You’ll spend most of that time learning on-the-job. Each year you’ll also spend several weeks studying in a classroom or shop setting. What do apprenticeship programs cost? There are tuition fees for the schooling part of apprenticeship programs and you will have to cover all or part of them. Generally, tuition costs from $100 to $800 per session, depending on the trade and the province or territory. You will also be responsible for travel and living expenses, and other expenses such as books, service fees and sometimes tools.